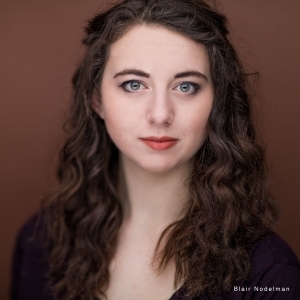 In this special guest blog, Actor Blair Nodelman talks frankly about how race and gender privilege have affected her family’s immigration and housing journeys and why This Place/Displaced feels important to her now. In 1913, my great-grandfather immigrated from Russia to the United States at only three years old. He arrived on Ellis Island, clutching his mother’s hand and still feeling the sway of the ocean beneath his feet after the two week journey. His Yiddish last name was traded for something that sounded more American, he was given a clean bill of health, and he was sent of his way to pursue what would become some sort of American Dream. When I walk through the Lower East Side of New York City, I feel the echoes of my great-grandfather all around me. The Jewish immigrant experience becomes nearly tangible, with the perfectly preserved synagogues and Kosher wine stores spilling out Hebrew letters and Yiddish exclamations. Even the neon lights of Katz Delicatessen greet me like an old family member, served with a side of latkes and Kosher pickles. Though I’ve never lived there, this place feels like home, as if it’s been plucked out of a moment in time, preserved for generations. Of course, the reality of my great-grandfather’s immigration story was not filled with the wafting sweet smells of challah baking or tourists wandering into Judaica shops. The filter through which we see the Lower East Side is tainted with tourism and a heavy dose of gentrification. The area that once abounded with the slums of Jewish immigrants is now home to multi-millionaires in apartment buildings with central A/C and tap access elevators. 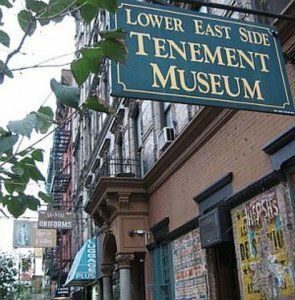 Clustered together amongst the newfound wealth are tenements preserved as a National Historical Site and accompanied by a museum with guided tours. The filter through which we see the Lower East Side is tainted with tourism and a heavy dose of gentrification. While the word “tenement” can refer to any multi-occupancy residence, within the context of the United States, they’ve become synonymous with slums or ghettos and home primarily to immigrants. The buildings that would become tenements were intended to be single family housing, generally about seven stories high. 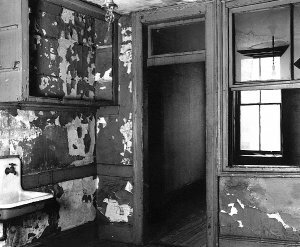 With the sudden population increase during the turn of the century, the buildings were split up, with nearly 2.3 million people packed into these often windowless and cramped living quarters. Still, the history of affordable housing in Boston is similar, with single-family homes being split into smaller and smaller spaces as families struggle to find housing with access to public transportation and city resources. By 1900, the Lower East Side was packed with nearly 700 people per acre, rivaling the modern day density of Bombay. Disease was rampant. Few units had indoor plumbing and an entire building would share one spigot for laundry, cooking, and washing. The infant mortality rate was 1 in 10. It wasn’t until 1901 that landlords were ordered to install at least one window in each unit and it wasn’t until 1918 that electricity was required. Rooms did not have proper ventilation, yet relied on coal burning stoves for warmth. Families ran businesses, often in the garment industry, from their cramped quarters, prioritizing room for the sewing machine over sleeping space. This was the Jewish world that my great-grandfather grew up in. Yes, the surrounding blocks were entirely comprised of Jewish shops, Yiddish newspapers, and a vibrant Jewish life, but the living conditions were stifling and because tenements were owned by private entities, there were few regulations as far as health and safety. No one cared for the wellbeing of these immigrants and it would be several more decades until these sort of living conditions were outlawed and heavily regulated. The tenements of the Lower East Side have since been memorialized with museums, glorified by historians, and marveled at by tourists. They have become a symbol of the American Dream, showing how one community rose from squalor to success. In a morbid way, the tenements were a blessing compared to the world many of these Jews came from across the ocean. But as important as it is to remember our history, it is even more important not to sentimentalize it. The tenements represented horrific living conditions for millions of people, yet the options were limited and there was little to no government subsidised housing for a Jewish family coming to the Lower East Side. The sociological and legal implications of that mobility are based on several factors, including on one hand my great-grandfather’s intelligence and tenacity, and on the other his gender and whiteness. Housing overall has changed drastically since that time. Government subsidized housing has become part of the American cultural vernacular, especially in urban communities. Safety and health regulations have become more stringent, in the hopes of ensuring a better quality of life for individuals. Private building owners of multiple occupancy buildings are held to higher standards. But while there are obvious benefits to public housing, it is an imperfect option. Similar to my family members’ experience, those who live in public housing have few choices. The conditions, while not as horrific as the tenements, are still less than ideal. Resources are limited and the capitalist society we live in ensures that those who are treading the poverty line remain in a limbo circumscribed by public housing policies, an obstacle my family avoided. My great-grandfather’s circumstances evolved rapidly over his lifetime. He was able to leave the tenements, attend City College, become a lawyer, and move to the Bronx, as most middle class Jews aspired to do. The sociological and legal implications of that mobility are based on several factors, including on one hand my great-grandfather’s intelligence and tenacity, and on the other his gender and whiteness. This isn’t to say he never experience anti-Semitism or that all American Jews have had the same experiences, but my grandfather’s circumstances were improved by his gender and his skin tone. Today, race- and gender-based discrimination straps certain individuals to a broken system with no end in sight. Too often, residents of public housing are assumed to be lazy and unmotivated, and are insulted with racist slurs. You can almost guarantee that drug addiction will be brought up as well. These remarks stem from a history of racism embedded in the American psyche, as most assume that public housing projects are overwhelming inhabited by people of color. We judge single mothers who rely on government subsidies,promoting gender discrimination at a vulnerable level. The attitude is overwhelming negative, perpetuating a detrimental reputation for millions of people. Housing inequity plays off of these existing stereotypes and systemic biases based in race, gender, ability, sexuality, and more. When I look back on my family’s journey to where we stand now, I understand that there is an immense amount of privilege that comes along with our story. There are circumstances that helped my great-grandfather move to the Bronx, that let my dad pursue a college degree, that allowed me to pursue the arts as a career. There are museums and photographs that honor my family’s experience, but I wonder if there will ever be a museum to honor those who live in poverty now, who suffer at the hands of a broken system, who are creating a livelihood despite all the obstacles. When will their museum come? And when will we as a society begin to utilize empathy for action? When I look back on my family’s journey to where we stand now, I understand that there is an immense amount of privilege that comes along with our story. This Place/Displaced is an opportunity to engage with audiences on these exact issues and elevate stories that are often dismissed and I hope this show becomes part of a necessary cultural shift. It’s a moment to sit together as a community in a theatre and not only recognize our neighbors, but regard everyone with the empathy they deserve, regardless of housing status.